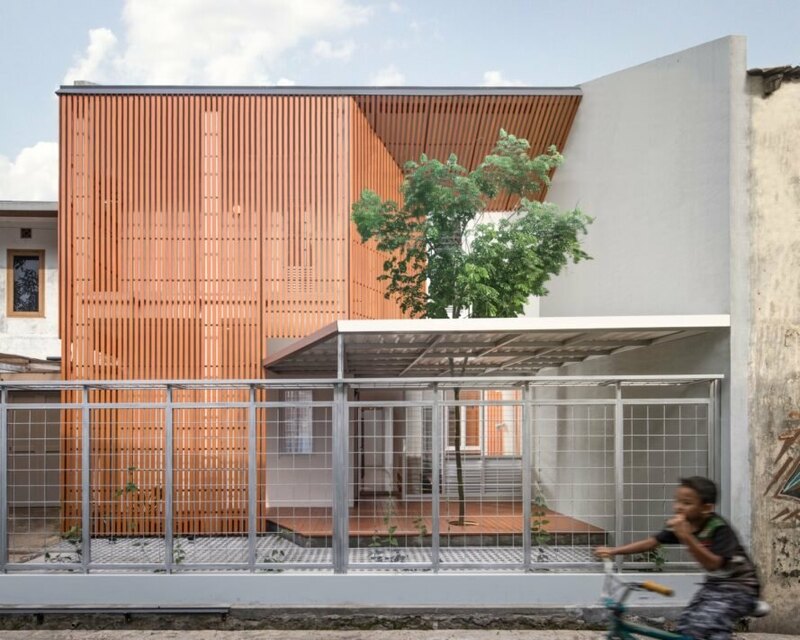 When Bandung-based architectural studio Aaksen Responsible Aarchitecture was asked to renovate an old house in the West Java neighborhood of Kiaracondong in Indonesia, they made a surprising discovery. During the demolition process, the architects found that the wooden roof truss structure was in very good condition, despite its age, thanks to a culturally significant type of timber, a kind of Albizzia wood that’s been mummified to improve strength and durability. Described by the architects as a “local treasure,” the timber was not only preserved in the roof truss, but also becomes a defining element in the contemporary home, aptly named the Albizzia House. Completed in 2019, the Albizzia House spans an area of approximately 2,000 square feet across two floors. The existing timber house was partly demolished to allow for a reorganization of the layout and a structural expansion. 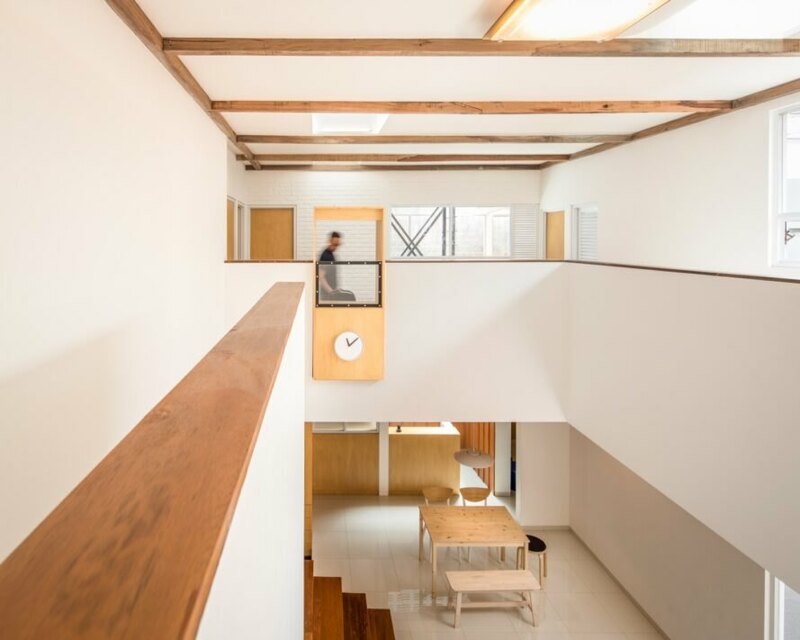 Organized around a light-filled atrium housing the primarily living spaces, the home now includes three bedrooms, garden and terrace spaces, a reading room and a ground-floor prayer room. 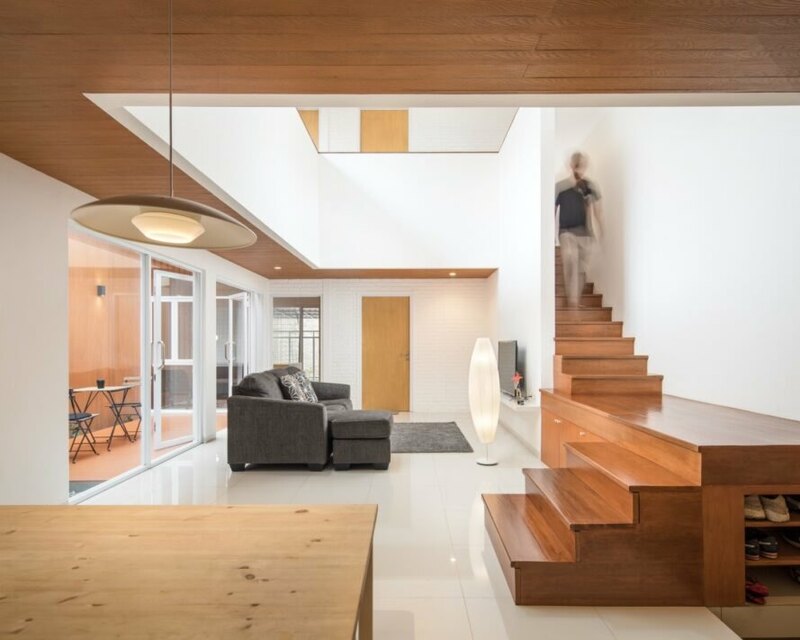 Natural light and ventilation is optimized in the renovated dwelling. One of the key changes to the house was the addition of timber cladding as a secondary skin to mitigate unwanted solar heat gain and privacy concerns. 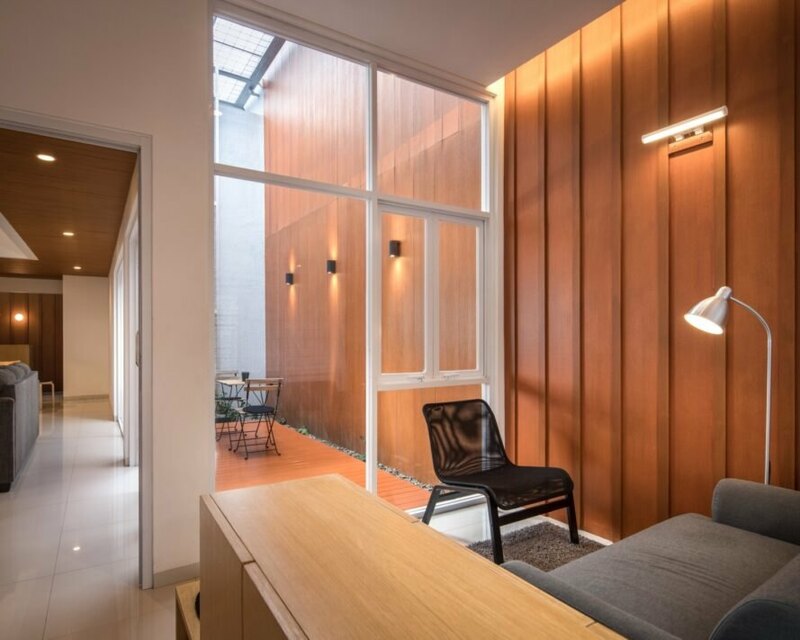 The vertical timber slats—and interior wooden furnishings—are a visual continuation of the Albizzia wood used as accents in the ceiling and reading room. The preserved wood in the existing building’s roof truss is also highlighted with the expansion of the truss into the new structure. Although Albizzia, a fast-growing and economical timber, is typically considered low-grade due to its weak and brittle qualities, local farmers in Ciamis, West Java, discovered long ago a method to improve upon the strength of the wood. In this “long-established technology,” the locally procured wood is buried under the paddy fields after the harvest season and the timber is then “mummified” in the compaction process, which, according to the architects, greatly increases the wood grade. The architects were shocked to find perfectly aged timber wood in the roof truss structure. The mummified timber became a defining element throughout the home. The Albizzia House spans an area of approximately 2,000 square feet across two floors. Local farmers in Ciamis, West Java, discovered how to strengthen and mummify the wood.